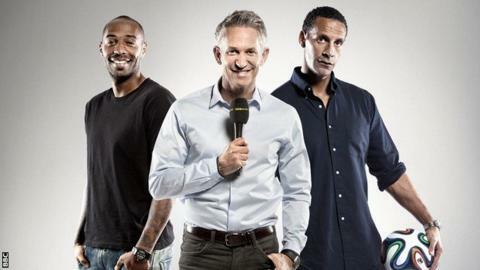 Thierry Henry and Rio Ferdinand head the list of BBC pundits for the 2014 Fifa World Cup in Brazil. There will be 31 matches shown live on BBC television and online, starting with Spain v Netherlands on Friday 13 June, with 24 days of live coverage on BBC Radio 5 live. England's first group match against Italy is live on BBC One on Saturday 14 June. There will be live text commentary on all 64 matches throughout the tournament, available on the BBC Sport website and app for mobile, tablet and connected TV. Gary Lineker leads the TV coverage and will be joined by former England captain Ferdinand, Henry - a World Cup winner and France's record goal scorer - and former Dutch midfielder and current AC Milan coach Clarence Seedorf. Former Brazil and Middlesbrough midfielder Juninho is another addition. Crystal Palace manager Tony Pulis and Tottenham Hotspur goalkeeper and former USA international Brad Friedel are new signings for the Radio 5 live punditry team along with Celtic manager and former Northern Ireland midfielder Neil Lennon, who will have a combined role across TV and radio. BBC Sport will bring you the first 24/7 World Cup from Brazil, bringing live coverage, every goal, expert analysis, breaking news, exclusive content and features - across any device, at any time. They join the BBC roster of former internationals working across TV and radio of Alan Hansen, Alan Shearer, Chris Waddle, Martin Keown, Kevin Kilbane, Mark Lawrenson, Danny Mills, Danny Murphy, Phil Neville, Robbie Savage, Pat Nevin, Jason Roberts and John Hartson. The World Cup marks Alan Hansen's last event as a BBC pundit before he retires from his Match Of The Day role after 22 years. Chief football correspondent Mike Ingham and commentator Alan Green are once again leading the 5 live commentary with their combined experience of 13 World Cups. This will be Mike's last World Cup as chief correspondent as he steps down from the role after Brazil. He will continue to present special programmes on 5 live. Online, bbc.co.uk/worldcup will be the go to destination for fans looking for enhanced live coverage, every goal, expert analysis, breaking news, exclusive content and interactive features - all available across any device at any time. As well as live matches there will be over 160 hours of TV programming, including highlights and match replays across BBC One, BBC Two, BBC Three, their respective HD channels and the red button. All content will be available to catch up on BBC iPlayer. Available across PC, tablet, mobile and connected TV, all the live video, radio, breaking news and highlights of every game will be available on any device, at any time. Online, BBC Sport will provide a wealth of exclusive content and interactive features, including a daily 'World Cup breakfast' video and Gary Lineker's iWonder guide to World Cup penalty shootouts. In addition to the football action, the BBC is producing a range of programmes across TV and radio that reflect the sights, sounds, culture and history of Brazil as well as delving deep into the heart of football, fronted by top names including David Beckham, Lineker and Ferdinand. View a full list of World Cup fixtures here.